Evangelism or Discipleship: What is the Purpose of Christian Film? Who are you making your movies for? What’s your target audience for the TV show? I’ve sat in rooms while people debated this for hours. One side was adamant that we should not expend resources making films for Christians, but we should only make content for non Christians, we should only do films with Gospel-centric messages. Period. There was no room for discussion. The other side was less strict, and while they understood the appeal of evangelism films, they felt that discipleship was a major component of much Christian content, teaching Christians is a worthwhile expenditure of resources. That pretty much summed it up, but there was still a couple of hours of discussion anyway. My perspective was simple. God gives each and every person a purpose in life. If he has called you to make video content, then tell the story he as called you to tell. Some stories will be for non Christians. Some will be for Christians. That’s OK. God gave you an unique vision. Maybe you have a passion to tell the Gospel story. Maybe you want religious people to live a pure life. Whatever it is, do that. My show is for Christians, about living with a biblical worldview. The script I’m working on is about what it means to be a part of the body of Christ. Obviously not evangelical. Those are the projects I’m working on now. Maybe the next one will be more evangelical. Bottom line, do the project God has given you a vision for. Do it and do it well. Let others debate the merits of evangelical vs disciple-making films. While they debate, you create. I have been looking at upgrading my Canon 60D, which I pretty much only use as a video camera. I have been considering either the Black Magic Pocket Cinema Camera or the Canon 70D. At just $1000, the BMPCC is an amazing device. Pro Res video codec, with RAW to be added later. 13 stops of dynamic range. Everything I’ve read about it leads me to believe that it would allow me to capture and edit amazing video. The 70D, though, comes with actual autofocus, uses my current lenses and card and batteries. And is actually available. The BMPCC is still backordered everywhere. And requires very fast cards, and with the included Pro Res codec… very big cards. Plus the battery life is reported to be very poor. Right off the bat, to make the BMPCC ready for me to use, I need to drop a couple hundred dollars on cards, and get a good EF to MFT mount adapter, and get more batteries. With those additions, the cost of the BMPCC jumps up over the 70D body by a couple hundred dollars. The 70D still has all the limitations of DSLR video. Compressed video. Limited audio. Limited dynamic range. But, the wifi and autofocus and other new features are appealing. The 70D would be a major upgrade for me. Of course, the video coming out of the BMPCC is so very nice. No, I’m definitely getting the 70D… maybe… probably. I keep wondering why I don’t run into more people who are actually making shows like mine. Better than mine. I walked the floor at NRB Convention last year and talked to a lot of people. None of them knew of other series like this. If that sample is to be believed, no one else is making a dramatic comedy series. Stand up comedy, sure. Sketch comedy, even. I have heard of a 30-minute drama. I’ve found a couple of Christian sitcoms out there, but the whole landscape is wide open for both comedy and drama. There’s just not that many being made. Is it really that hard to make a dramatic series? 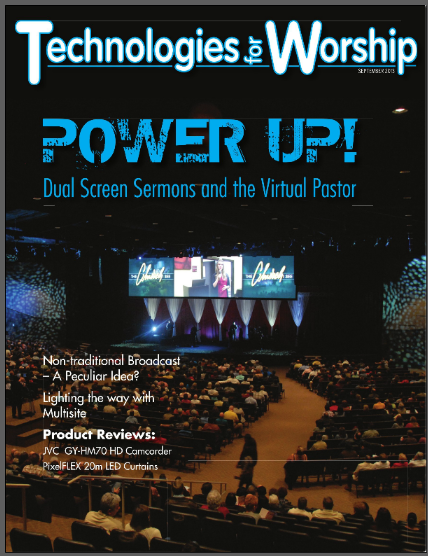 Here’s the online version of the September Technologies for Worship Magazine. On page 19 there is an article I wrote about how we created Peculiar for next to nothing. The gear list in the article? Half of that gear was borrowed, not bought. It is possible to do this. 1. Audacity. The simple, unfiltered audacity to believe that you can make something, that you can create it. 2. Perseverance. You will get tired, you will hit roadblocks, you will want to quit sometimes. If you quit, you will never finish. Simple, I know, but most truths are. Want to make a dramatic TV series? Then keep making it until it’s done. 3. Flexibility. Things will not always be ideal, they won’t be the way you want them. You will compromise, you will wish you had something you don’t. Become good at logistics. Figure out how to get it done, and then do it. In the end, it’s more about resourcefulness than resources. 4. Teamwork. You can’t do it alone. Network, go to conferences, join Facebook groups, meet people. Develop of group of friends that have common goals and dreams. Work on each other’s projects. Cast a vision for yours, and lead them to accomplish it. 5. Learning. Read, take classes, help other people with their projects, subscribe to Youtube channels, follow people on twitter. Never stop learning, and never stop practicing. This will come in phases. I am learning right now about better script writing, and in the process I am improving my feature length script. Before this was budgeting. Don’t believe the lie that you don’t know enough, aren’t good enough to do it. If I had listened to that voice, I wouldn’t have 10 episodes of my show, Peculiar. Is it perfect? Nope. Not even close. But it’s 100% better than what it would be if I was still waiting to be “good enough” to do it. You can do it! Believe it.